A place to live is a one of the most basic human needs. Unfortunately, housing has now become a source of income for those who can afford to ‘buy to let’ or ‘buy to sit’ (buy and leave empty). Using housing as a way to make money has meant that rents and house prices are ever increasing, spiralling out of control in places like London. Therefore, for the most of us, paying for housing has become increasingly difficult. In London people spend on average more than 50% of their income on rent or mortgage payments. Together with low wages and benefit cuts, cost of housing is yet another attack on the working class, as the government, banks and corporations make us pay for their crisis. Government policy that encourages people to want to buy their own home, eg right to buy, low interest rates. They do this because if people feel that they own a home they will be more likely to spend money on credit, thus keeping the economy going. The problem is that they don’t own their own homes, the banks do. Government encouragement to foreign property speculators. Governments have been unwilling to spend money on housing. A way to get homes built is to get in foreign money. Developers know that they can sell their properties to these rich buyers, so are more likely to invest in housing. But, the vast majority of these are out of reach of the average renter or buyer. People are forced into overcrowded accommodation in order to afford the high prices. Apart from generally making people suffer financial hardship, struggling to make ends meet, the consequences are very far-reaching, affecting the very character of urban areas. As the money is to be made in the centres of cities, people are being forced further and further out in order to find rents/prices they can afford. Those on benefit find themselves forced to relocate to cheaper areas, far from friends and families. This is happening a lot in London because it is not just the centre that is the target for developers but most of the city. This means that many people are being sent out of London all together. The other consequence is that the whole economy is very precarious; too much depends on the housing prices continuing to rise. It doesn’t have to take much for a few people to lose confidence, for foreign borrowers to panic and the whole house of cards could come tumbling down, just like it did in the last crisis. In many cities, the housing crisis has given rise to a host of campaigns that are challenging the current situation. These campaigns were already well-underway before the election and they knew that they would have to carry on fighting no matter what political party got in. Some campaigns focus on anti-eviction work, for example the E15 mothers who successfully stopped the relocation of the young mothers out of London. They continue to campaign against individual evictions and against social cleansing. Others are fighting the demolition of whole estates as housing associations and councils sell of their properties to private developers. Resistance has been militant, with a number of occupations, such as the one on Aylesbury Estate in south London. The Boleyn Ground 100 campaign is an ambitious one. Realising that the main source of the problem is a lack of social housing, they are demanding 100% social housing to be built on the grounds of the West Ham stadium when the team is relocated. What is particularly significant about what is happening is that the various campaigns are gradually linking up. This process is helped by the formation of the Radical Housing Network which is made up of grass roots campaigns from all over London. This is helping to create a full-blown housing movement rather than just a number of isolated campaigns. And it is not just a movement of political activists, but one made up of people from the local communities fighting to save their homes from demolition or struggling against rent increases and evictions. And there have been victories! 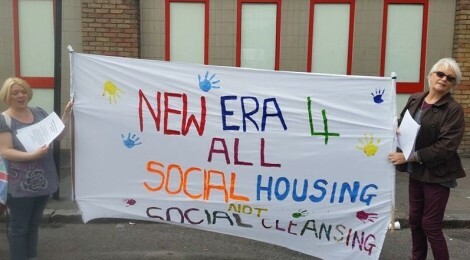 The New Era Estate in Hackney defeated an American company and won the right to stay on social rents. We can all be encouraged by this determination to fight back and win, showing what we can do if we build resilient communities.